What does a day at NOLA Nature School look like? By hiking to the classroom, the children are softly transitioned from drop-off into the nature school day. The distance between the drop-of point and the Forest Classroom firmly grounds them in the sense that they are preparing to inhabit a new space. Along the way they share stories from home, enthuse about what they look forward to in the upcoming day, and take time to notice both enduring and novel features of the familiar path. 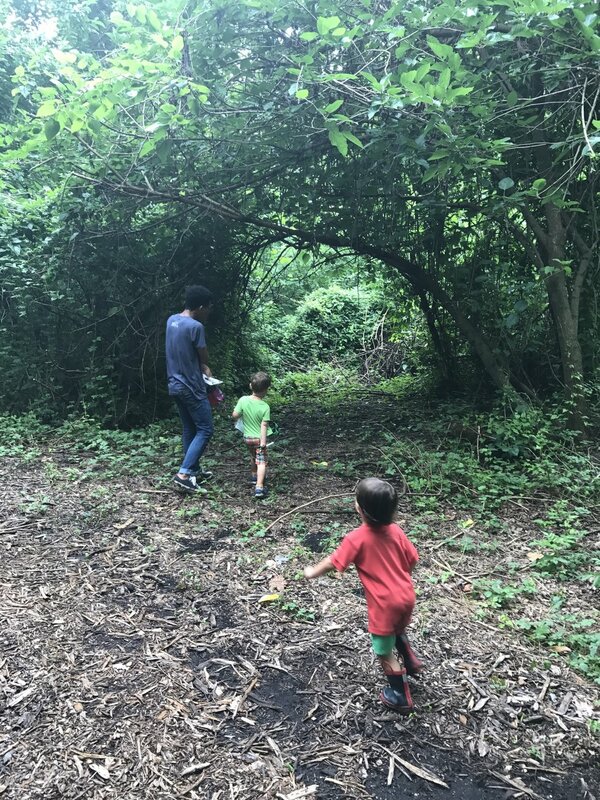 Upon reaching the Forest Classroom, the children greet one another. Next, they say a hearty ‘Hello!’ to each of the four cardinal directions. Following the morning greetings, the children all listen to a story. This story may be one from a book or one that the children have co-created with each other or their teacher. Following the story, the children split into small groups for exploration and free play. By splitting into smaller groups over an extended period of time the children can quickly settle into a stable rhythm of exploration and free play. Not only do smaller groups create, over time, a lasting sense of cohesion, but they also allow teachers to closely observe ongoing themes in children’s play and to more effectively scaffold socioemotional and pre-academic development. 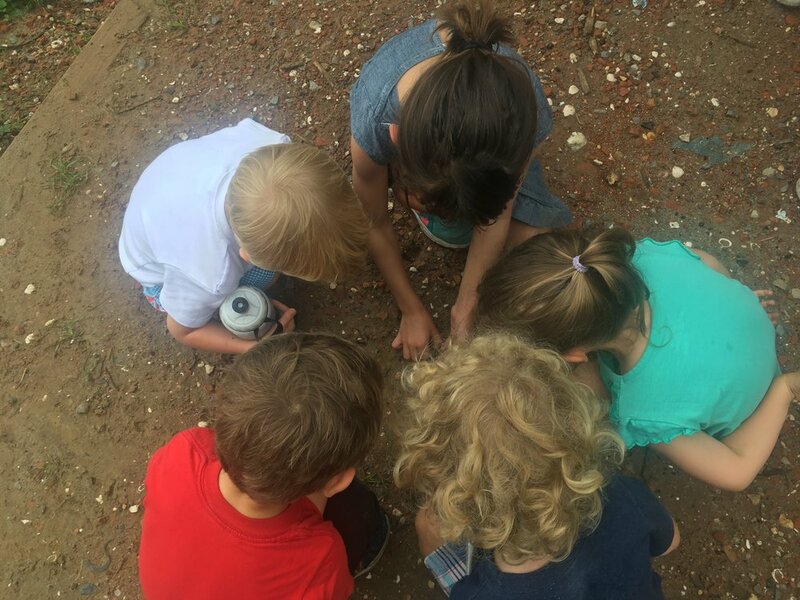 Near the middle of the day, after the children have had time to play, they are invited to a small period of intentional noticing. In sit-spots, children sit for at least five minutes in an area of their choice—the same area each day—and take time to look and listen. They are also invited to ask what is the same, different, interesting, or important about their spot on any particular day. Their observations are recorded in their journal Not only does this aid executive functioning, but sit spots also promote close observation, scientific drawing, and encourage children to become mini-experts. The children are provided with a wholesome snack featuring fresh fruit, whole-grain breads, and homemade butters and jams. Everyone gathers around a blanket in order to experience community with one another. At the close of our morning all of the children come together around the circle and co-create a representation of the learning and experience that occurred during the day. The Floorbook—developed by Nature Preschool expert Claire Warden of Scotland—is a way to reflect on the day and allows each child to add their voice to the whole. We are a team of dedicated and diverse educators with a passion for the outdoors and many years of individual and collective experience. Favorite place in nature: By the ocean. "Born and raised in Maryland, I grew up exploring the Chesapeake Bay and the Appalachian Mountains. For the past eight years I have been falling in love with the bayous, swamps, and coast of Louisiana. I received a BFA in Photography from The Corcoran College of Art and Design. I received a M.Ed at Antioch University New England in Early Childhood Education with a focus on Nature Preschools. I love reading, gardening, and hanging out with my three dogs, two cats, and rabbit." Favorite place in nature: Anywhere near the water. Favorite place in nature: Anywhere from which you can see the sunset. "While studying psychology at Stanford University I was struck by children's abilities to construct and navigate their social worlds. I am passionate about building communities of confident, curious, and caring learners." Favorite place in nature: Any beach with clear water. Favorite place in nature: By the Norwegian Archipelago.